(from msn.com) He was a nocturnal creature who gambled all night and slept all day. He took Valium at times for anxiousness, and had the doctor who prescribed it to him on retainer. He wagered up to a million dollars a night, but wandered around glitzy Las Vegas casinos in sweatpants and flip-flops, and carried his own drink into the high rollers’ area because he didn’t want to tip the waitresses too much. This was Stephen Paddock as he saw himself four years before he opened fire on a crowd of concertgoers, killing at least 58 people in the worst mass shooting in modern American history. The details are contained in a 97-page court deposition obtained exclusively by CNN. 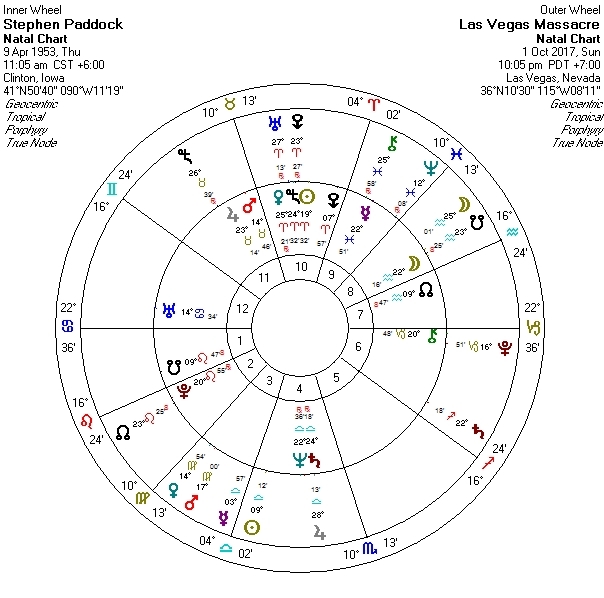 Paddock was deposed October 29, 2013 as part of a civil lawsuit against the Cosmopolitan Hotel, where he slipped and fell on a walkway in 2011. What otherwise would have been a mundane proceeding offers fresh details about Paddock’s life and habits — for the first time — from the killer’s own mouth. The document has been turned over to the FBI, according to sources. Paddock’s testimony offers little insight into what could have prompted last week’s attack. He said that he had no mental health issues, no history of addiction and no criminal record. He said he was prescribed Valium “for anxiousness” by Nevada internist Steven P. Winkler. It was unclear how often he took the drug, but he estimated that he had 10 or 15 pills remaining in a bottle of 60 that were prescribed a year and a half earlier. Rage, aggressiveness and irritability are among the possible side effects of taking diazepam — better known as Valium, according to a manufacturer of the drug. It is not known when Paddock last took the drug. The Las Vegas Review-Journal reported that Dr. Winkler prescribed him diazepam in June, based on information contained in Nevada’s prescription drug monitoring database. CNN could not independently confirm that information. Paddock was asked whether he had a good relationship with the doctor who prescribed him the pills. Winkler did not respond to an email or phone call seeking comment for this story. Reporters were turned away by a security guard after seeking access to the gated community where he lives. In the deposition, Paddock said he had a concealed weapons license in Texas, but, other than that, there was no discussion of guns. His de facto home was often one of the casinos, where he stayed in rooms that were provided for free “95% of the time.” Hotels often provide free rooms and amenities to big gamblers to entice them back to their casinos. At the Cosmopolitan, he said he had opened a bottle of sake in his room, possibly on the night of the incident, but did not drink much. A lawyer asked him to explain why he would open the beverage but not drink it. “And if you aren’t comped at casinos, you wouldn’t understand,” he added. He said he wandered about in black Nike sweat pants and had a favorite pair of size 13 black flip-flops — the pair he was wearing on the night of his accident at the Cosmopolitan in October 2011. He was on his way to the high-limit room when he slipped on some liquid and fell. He testified that he hurt his hamstring, which he said resulted in a lingering injury. An arbitrator ultimately ruled in the Cosmopolitan’s favor, according to two sources. Some of the testimony centered on his gambling. “Each time I push the button, it will range from $100 to $1,350,” he said. A lawyer asked how much he could end up betting on a given night. “A million dollars,” Paddock replied. “That’s a lot of money,” the lawyer said. “No, it’s not,” Paddock said. The deposition also offered some clarity on basic biographical information about the enigmatic killer. He was “raised mostly in California,” attending high school in the Sun Valley section of Los Angeles and college at what would become Cal State Northridge. He worked for a time as an IRS agent, then began to invest in real estate. Paddock did not detail the initial source of his wealth. He at times came off as arrogant and sarcastic during the deposition, the transcript suggests. At one point he was asked whether he was sober on the night of the accident. Witness have said he berated his girlfriend in public on occasion too. Natal Moon in Aquarius (8th house) opposition Pluto in Leo retrograde (2nd house): He was described as cool and rationale, detached, arrogant, confident (also likely to be of high intelligence) – yet from what is described, he could be emotionally short fused, condescending, and volatile. Jupiter in Taurus (11th house) forms a t-square with this Moon/Pluto opposition, adding to his extremist nature. Natal Venus retrograde and Sedna are conjunct in Aries in the 10th house (a bottled up combo) and in opposition to Saturn retrograde/Neptune retrograde in Libra in his 4th house. This Venus/Sedna opposition Saturn/Neptune is also dynamically situated (square) his Ascendant/Descendant axis. Chiron in Capricorn in the 6th is also involved in this grand cardinal cross. This bottled up and under pressure combination finds its release through the triggering of the natal Moon/Pluto opposition. Note the below event chart (outer wheel) relative to the natal chart to see this demonstrated by the transiting moon and south node. The transiting south node is situated at 23 Aquarius, only one degree balsamic to his natal moon and almost in exact 1/4 square aspect (action aspect) to Jupiter . Also, the transiting moon had just conjoined both (roughly six hours before the shooting. 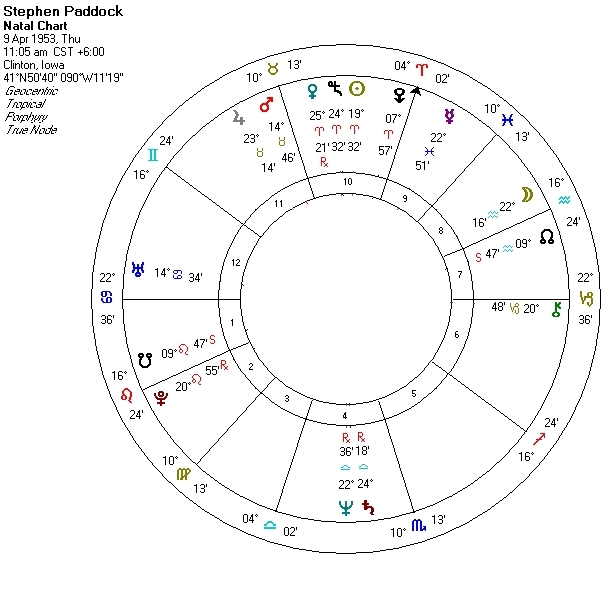 The transiting moon opposed his natal Pluto 10 hours earlier. Transiting Uranus in Aries was also of influence for an extended period of time. It first made contact with Venus/Sedna in the spring of 2016, but its triggering influence can be seen back to the time when transiting Uranus opposed natal Sun (spring/summer of 2015) and further back to the time when transiting Uranus square the natal Uranus position (spring to autumn) of 2014. The deadliest shooting in recent US history unfolded – as most do – in a storm of chaos and confusion. Though the enormity of the situation emerged quickly Sunday night, details were still emerging of exactly what happened more than 48 hours later. Thursday: Stephen Paddock checks into the Mandalay Bay Resort and Casino on the south end of the Las Vegas Strip. Paddock first arrived at the Mandalay Bay on Thursday. According to the Associated Press, he asked for a high-level suite overlooking the Route 91 Harvest festival – but couldn’t immediately get one. A hotel source said that he didn’t move in to the 32nd-floor room he used for the shooting until Saturday, the night before the attack. Sunday, 9:40 p.m.: Route 91 Harvest festival begins its closing act. 10:05 p.m.: Paddock opens fire. Las Vegas police say that Paddock fired “a dozen or so volleys” during the shooting. 58 people died. Within seven minutes of the shooting they had made their way to the 31st floor, according to an official police timeline, and knew the shooter was one floor above them. 10:13 p.m.: Police outside realize where the shots are coming from. “It’s coming from like the 50th or 60th floor, north of the Mandalay Bay! It’s coming out a window. Police say that Paddock kept firing for “nine to 11 minutes.” In a briefing on Wednesday evening, a police gave a final time for the end of the attack as 10:15 p.m.
10:15 – 10:18 p.m.: Paddock shoots a hotel security guard. The first person to approach Paddock’s room was a hotel security guard, according to Las Vegas police. The exact timing is not clear. Paddock shot him through the door of his suite as he approached, and hit the man in the leg. He apparently unloaded more than 200 rounds into the corridor. The guard managed to get to safety, and told police exactly where Paddock was holed up. 10:17 p.m.: First police arrive on Paddock’s floor. The LVMPD timeline says that two of its officers were on the 32nd floor by 10:17 p.m., 12 minutes after the attack began. They are soon joined by eight more officers, and spent some of the following 15 minutes systematically searching the floor’s other rooms and evacuating guests. 10:24 p.m.: Police officers gather near Paddock’s room. Again citing police radio, The New York Times said officers were right outside Paddock’s hotel room at 10:24 p.m., 16 minutes after the shooting began. It would be almost another hour, however, until officers would break into Paddock’s room. According to Newsweek, officers asked permission to enter Paddock’s room sooner but were told to wait for SWAT teams. Las Vegas Metropolitan Police Department Undersheriff Kevin C. McMahill defended that decision in a press conference, saying that waiting was an option because Paddock was “contained” and had stopped firing out of the window. 11:20 p.m.: SWAT teams break into Paddock’s room and find him dead. One hour, 12 minutes after the first shots were fired, a police SWAT unit detonated an explosive device to break down Paddock’s door, according to the police tiemline. SWAT officers noticed a second, closed, door when they burst into Paddock’s suite, and could not immediately be sure what was behind it. It was not until 31 minutes past midnight – more than an hour since Paddock was found dead – that the police department sent a follow-up tweet saying it thought the dead man was the only attacker. Two hours, 26 minutes after it began, the massacre was officially over.